Our reconditioned stair lifts have been used as demo units at trade shows, or as floor models in brick-and-mortar stores. 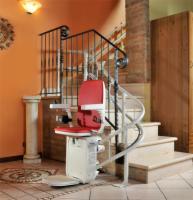 Reconditioned stairlifts have never been used in a private home. All track is new and custom-fit to your specifications, and DC-operated models always have new batteries installed in them prior to delivery. With a certified Factory Reconditioned Stair Lift, it is possible to save money, without sacrificing safety. For additional information about our reconditioned stair lifts, contact our stair lift experts by dialing 1 (888) 301-2610. When you purchase a reconditioned stair lift, you will enjoy a product that looks and operate like new, but costs you less! 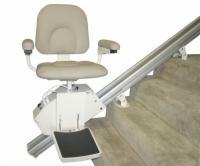 This model features the best in stair lift design and technology and is perfect for narrow staircases. 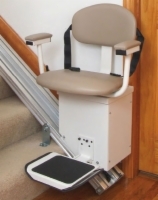 Reduce tripping hazards with the Rave Stair Lift with Folding Rail. The folding rail folds the track out of harms way when not in use, saving even more space on an ultra-compact design. Buy the reconditioned and enjoy huge savings with a warranty too! 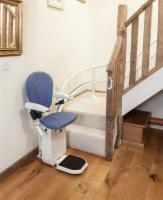 The following Ten Best Reasons to Buy an AmeriGlide Stair lift comes directly from the President of AmeriGlide.